Nor can the policyholder know where the investment component of her premium is invested and what its value is at any given point of time. This is a serious flaw when endowment is positioned as a package of insurance and investment. (b) Traditional Endowment conceals a feature which is never made known to the policyholder. Premium of an endowment plan is in principle made up of (as said before) (i) risk premium / mortality premium (the cost of the life cover), (ii) charges (operational and marketing expenses of the insurer) and (iii) investment component. 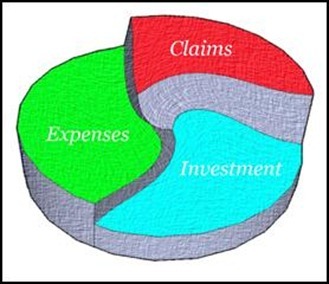 The risk premium is supposed to go into a risk pool which is to be used for meeting the claims during the year; the charges are supposed to be used for meeting the operational and marketing expenses of the insurer during the year; and the investment component, as its name implies, is supposed to be invested – it is supposed to go towards payment of the maturity amount to the policyholder at the end of the term of the policy. But this division is only conceptual in case of a Traditional Endowment; unlike in an ULIP, in a Traditional Endowment the investment component is not firewalled. The entire premium is held in a single pool out of which the claims and expenses are met; and the balance remains invested. As a result any adverse variations in mortality (higher than estimated claims) or expenses go out of the amount which actually should have gone into investment. Thus the adverse variations in claims and expenses are borne by both the insurer and the policyholder. This is unjust because adverse variations in mortality are largely a consequence of poor underwriting (estimation of risk in an insurance proposal) by the insurer; and an adverse variation in expenses is largely a consequence of inadequate cost control by the insurer. This sharing of risk by the insurer and insured is against the basic tenets of insurance. In Term Plan for instance, the risk of adverse variations in mortality and expenses is borne entirely by the insurer. It has to be so because the insured has no control over mortality or expenses. But, perhaps, the most flagrant fraud on the consumer is the Endowment (both Traditional and ULIP) itself. At a time when the common investor had little alternative investment avenues it made sense for the insurance companies to package investment with insurance. But such a practice is clearly anachronistic at a time when the market is flooded with investment options. Under changed circumstances, Endowment serves no purpose. Investment is definitely not the core competency of the insurance companies; why should anyone entrust her investment to an insurance company ? The protection that a policyholder seeks can be obtained through a Pure Term Plan – where you pay only the risk premium (plus the expenses, of course), and no investment component is added on. Packaging insurance and investment together, as done in a Traditional Endowment is worse because of the risk of adverse variations in mortality and expenses being inadvertently pushed on the policyholder (as seen above). Am I saying that Endowment as an insurance product needs to go ? Yes, that is exactly what I am saying. But hold on. There is a proviso for that. An Endowment can be a meaningful and useful insurance product if and only if it comes with a waiver of premium (WOP) rider. What I am proposing therefore is that the WOP rider be made an integral part of an Endowment, be it Traditional or ULIP. An endowment without waiver of premium (WOP) is not insurance! Will Bengal Be The Next IT/ITES Hub Of India?